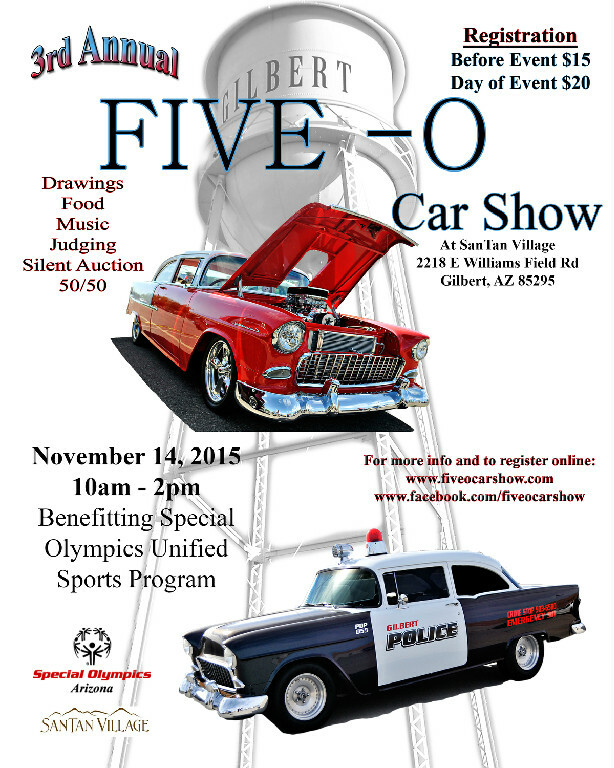 The Gilbert Police Department is hosting their 3rd annual Five-O Car Show for Special Olympics. 100% of the proceeds will go to the Special Olympics of Arizona athletes. Pre-registration is $15 and the day of registration is $20. This year there will be trophies for “Best in Show”, 1st, 2nd, 3rd place and the Special Olympic athletes will be choosing their favorite vehicle. All judging will be done by the participants. There will be food trucks, 50/50 raffle, lots of silent auctions, tons of raffles prizes and event t-shirts for only $10. The Gilbert Police Department will have displays and demos set up during the event that include, K-9 demos, SWAT displays, police vehicle displays, and much more. For more info and online registration visit our website at: http://www.fiveocarshow.com and to keep updated on the show visit our Facebook page at: http://www.facebook.com/fiveocarshow or our Twitter page at: Five-O Car Show @FiveOCarShow.